Social-media ready selfies with branded props are the rage at weddings, birthday parties and corporate events. But the big money is in captured text and email links which are a form of monetizable data that can be sold to third parties. A machine named Queso wants me to pose like a spy. A short video shows three people making finger guns, backs against one another, and even though I feel awkward doing this alone in the middle of a Las Vegas convention show floor, I oblige. Next, Queso says to pretend like I’m thinking, and I’m beginning to understand why this photo booth was named after cheese. Finally, it tells me to jump around. I hop a few times until Queso floods me with light for the final time. Then I quickly gather my things and move behind the machine to retrieve a copy of my pictures. But there is no printout — yet again. I came to the fifth annual Photo Booth Expo hoping to go home with a comically large pile of selfies, but none of the 40-something exhibiting photo booths have printed out anything. Instead, they’re offering to email or text links to the photos for easy online sharing. 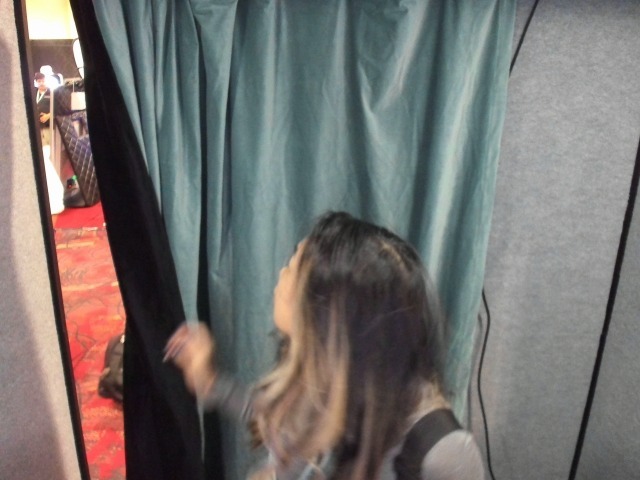 This is the state of photo booths in 2019. What was once on a highway to extinction has been reborn as an Instagram machine, transforming the humble self-portrait into theatrical displays for social media currency. While the machines pander to the young demographic that loves these experiences the most, they’re also monetizing a valuable asset in exchange: their data. ToTo photo booth operators, there are two types of customers, says Brandon Wong, founder of Photobooth Supply Co. (PBSCO). First, there is the birthday, wedding, and anniversary party crowd, which are the types of events that make people want to take home a souvenir. “Everyone’s already dressed up, looks great, and wants a fantastic picture to hang up,” Wong says. But the second type — corporate events — is where the growth potential is. That’s why PBSCO’s two machines on exhibit, Queso and Salsa, didn’t print any photos at the show, he says. Instead, they’re designed to be shared digitally. “The goal is to encourage attendees to take pictures and show it off online and create FOMO,” Wong adds. The photo booth’s modern revival roots back to 2010, the same year that both the iPad and Instagram were born. Event photographers could now build smaller, cheaper photo booths that relied on the tablet and then email the photos to customers instead of having full-sized cameras and photochemical solutions. All the while, Instagram encouraged people to think of their online counterpart as a visual homepage that’s filled with unique photos that presented them as their most interesting, beautiful selves. As Instagram culture grew, so did the demand for even more elaborate selfies. Today, photo booth operators spend their time crafting spaces in the same ways that restaurants are intentionally designed to go viral, using intricate backdrops, props, and kitschy decor to invite patrons in. 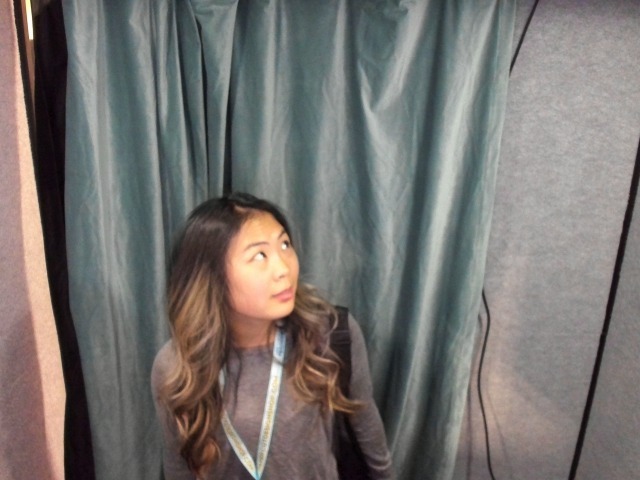 That shareability, Wong says, has revitalized the business of photo booths. Depending on where you are and how customized you want the booth to be, these machines can now be rented for as low as a few hundred dollars a session. To event planners, especially those planning corporate events, investing in this experience is a no-brainer. The pre-internet machines found all over malls, arcades, bars, and movie theaters are classified as “closed.” First introduced in the US in 1925, these kiosks became a symbol of pop culture after Andy Warhol used them as a medium for his portrait work in the ‘60s. Over the next few decades, they would go from mall staples to relics as the machines declined alongside US mall culture in the 2000s when the retail industry moved online. Other machines employ multiple cameras. The ArrayBooth features a three- or six-DSLR camera rig that form a wide curve with a built-in LED light to create a video 3D effect. The company also animates graphics post-processing, with arrows zig-zagging around the subject to create an even more Instagrammable result. As people line up to take their perfect in-your-face photo, the pressure to compose a unique pose grows. It seems as if each group wants to out-cool the last group as they practice jumps and hand positions before stepping into the spotlight. Operators are also beginning to think about other places where a photo booth could be retrofitted. 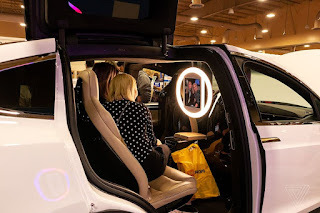 The Simple Booth Halo, a light ring with an iPad in the middle, lined one wall of the convention hall like touchscreen menus at a modern fast food restaurant or bathroom mirrors at a bar. 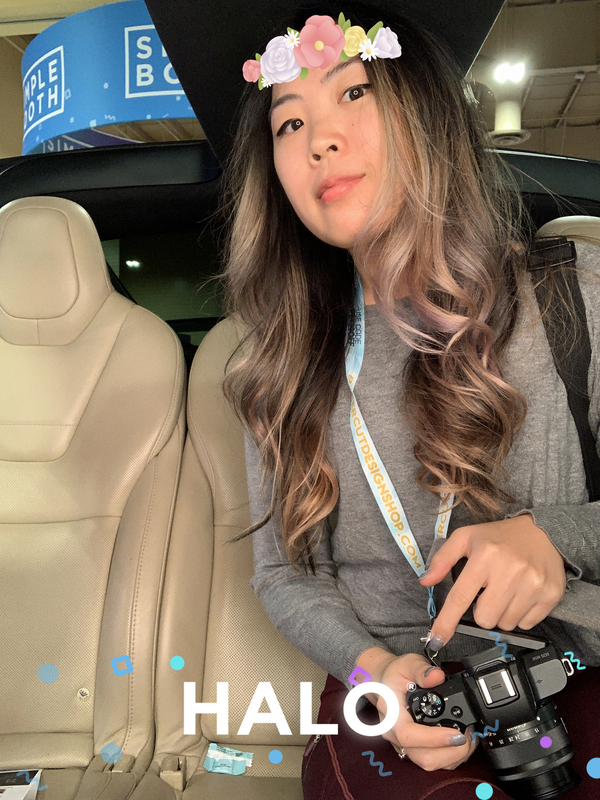 One Halo machine was embedded inside of a Tesla Model X. I’m unclear when a photo shoot inside a car is practical, but if you’re ever worried that a car interior is too dark for your “on my way to steal your bae” selfie, rest assured, there’s a solution. The machines get progressively unconventional as I roam the halls. Tucked in a corner is an enclosed karaoke booth with a webcam that can record or take pictures of you singing. Reluctantly, I push the curtain aside and enter, in that skeptical way you do when there’s a hole in a wall and you’re not sure what’s on the other side. Inside, I’m greeted by a massive screen that prompts me to choose between a video or photo capture. After publicly failing in front of everyone inside the Slow Go 360, I opt for the humble still photo. At the song selection screen, I choose “Hello” by Adele since it is listed first alphabetically. I was already beginning to regret this booth when the melancholy piano intro booms into my ears, startling me so much that I fall back against the curtain and nearly tumble out of the booth. People immediately begin peering into the window, trying to see what is going on. By the time I regain my stance and look around for the camera, I realize my photos have already been taken. Humbled, indeed. I leave the karaoke booth mortified. As I walked away, I notice a pair of eyes following me. To my right is Occo, “the robot that makes you smile.” The machine has a Wall-E-like head with two glowing eyes and an oversized tablet body. Occo appears to have been fixated on my walking direction until I stopped. After pausing for a few seconds, it snaps a photo of me. ccoOcco may be one of the few photo booths that overtly surveils you, but the reality is that most digital machines today are likely already doing it under the guise of fun. As companies use photo booths to grow their marketing, they’re also used to collect the data you give when you enter an email or phone number to retrieve a picture. Patrick, who requested The Verge used a pseudonym, learned this shortly after beginning his career as a photo booth operator in Alabama. After meeting a client at a wedding who hired him for a corporate event, Patrick realized that photo booths were an opportunity for marketers to generate leads off the information people put into the machines to get their pictures. If ever there was an analogy for technology in 2019, the photo booth may be the mascot. What was once an innocuous machine designed to help you socialize and capture moments with friends has now been reappropriated to gather data for profit. In pursuit of shareability, machines are incentivized to create viral-worthy, multimedia content that, in turn, receive and funnel data straight to advertisers. Some photo booths, like Baltimore-based Pixilated, can even follow the same email address to track the specific events a customer attends. While some operators don’t make it a secret that their photo booths have transformed from providing a tangible good (a photo strip) to a service (data aggregation), suppliers like PBSCO are finding it to be their responsibility to reckon with customer privacy. Though Wong says his company doesn’t hold on to any customer data from private events, it does keep emails from industry shows to send sales pitches. He also says PBSCO machines include two screens of disclaimers so people have to “double opt-in” for marketing content. But as recent congressional probes into tech giants like Facebook, Google, and Twitter have made clear, tech companies still haven’t gotten privacy policies right — and it’s unlikely that anyone will bother to read a company’s terms of service before rushing to take fabulous selfies and download their copy to post for likes. While advertisers, tech firms, and lawmakers continue to disagree about federal internet privacy regulations, savvy marketers are left with the ability to get creative with ways to manipulate data collection, leaving one to wonder if an ethereal video of confetti slowly raining over your head is worth it in the first place. AsAs modern photo booths become an extension of our most beautiful internet lives, the nostalgia for analog booths remains. Photobooth.net has been cataloging the locations of these machines across the world since 2005, listing both their appearances and disappearances from various sites and whether they’re still functional. Today, most have gone into private collections; in the US, the few hundred booths that remain are found in arcades, bars, and — unironically — museums. Sitting before a vintage booth, you didn’t always know what you were going to get. Maybe the image contrast would be too high, maybe you’d miss half the frame, or perhaps the printer was running low on ink. But when the photo printed, you knew it was yours to keep. As photo booths have evolved into social media machines and data aggregators in disguise, the ones that still print physical photos remind us of their original purpose: to capture the moments that bring people together, which are best savored by those who appeared in the photos. When I returned to New York, I looked through the digital copies of my adventures in Vegas. The weekend before I left for the expo, I had the opportunity to take a photo in an analog booth at a friend’s engagement party, but I scoffed at the seemingly exorbitant $5 fee. In retrospect, maybe I should have just paid for the intimacy behind those curtains.